E-mail Versus Linking To A Blog Post… Which Is Best? I’ve had a couple lengthy conversations with Jim Yaghi this week. The guy is frickin’ brilliant! He has an IQ of 156. That’s only 4 points lower than Einstein, don’t ya know. He doesn’t feel a need to brag about it or plaster it all over his website and everything he publishes. The chest-beating, self aggrandizing thing isn’t his style. The only reason I know about his IQ is because of an ongoing inside joke we have in our mastermind group. Jim is one of those “under the radar” experts. For several years now, I’ve conspired with several other marketers to keep him our little secret. Yes, I’m being selfish. I don’t want to share him. You see, Jim has accomplished mini-miracles with PPC (pay per click). Time and time again, he has done what most “experts” said was impossible… get affordable clicks and conversions in the most expensive, competitive and cut-throat niches. That’s why I recently hired him for a new project I’m putting together. Anyhoo… Jim has a unique perspective on the long term investment and payoff from a properly promoted blog. It resonates with some thoughts and concerns I’ve had recently. First of all, I’m not really feeling this “send e-mails instead of directing people to the blog” thing. In one of my other businesses, it immediately TRIPLED sales from e-mail marketing. But this blog is a different animal. I’m trying to build a long term community of like-minded people. I’m not looking for an immediate payoff. Like I mentioned in a previous post, one of the things that has suffered from the “send e-mails instead of directing people to a blog post” is the amount of comments. It’s important for me that you know I appreciate your comments. I read every one… and try to respond to most of them, too. When I’m really busy and can’t respond, I get concerned you may feel like I’m “snubbing” you… or something like that. I promise you that’s not the case. Recently I’ve taken on a LOT of work. I’m completely re-inventing my main biz and working on three other big projects… and several smaller “bread and butter” projects, too. I’m busier than I’ve been in years. I’m “making hay while the sun is still shining”… for urgent reasons I’m only sharing with my Inner Circle clients and private mastermind group. So please don’t feel bad if I can’t immediately respond to your comments. I promise you I read them all and will respond when I can. 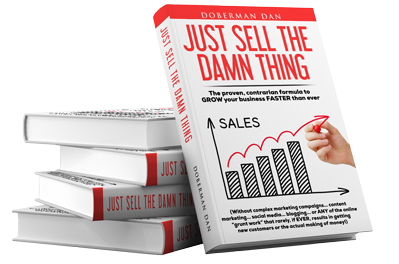 Several very sharp marketers have told me I’m wasting my time doing all this… and should only spend my time with people who are BUYERS… not just subscribers to a free blog. I guess that’s true… if you only look at immediate return on investment. But I’m looking at the bigger picture. Yes, it’s true I’m in the process of building a business around what I do here at DobermanDan.com. I’ve made that very clear. But I’m not going to slack off on my free content just because I’m soon going to be offering more paid content. So my DobermanDan.com “e-mail versus blog post” experiment has ended… for now. I’m glad I tried it. It’s paying off big time in other niches… but may not be the best thing right now to support my plans for this blog. Why not give it a try yourself and let me know how it works out?